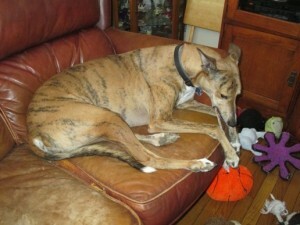 Today,I would like to introduce the Greyhound furriends “Jake”. Jake’s mom “Holly” from PA sent us feedback along with great pictures of Jake enjoying our Grass-fed Moo!Odor free Junior Bullys 11″-12″. I would like to share them here. Jake will be 5 in October. We adopted him at 5-1/2 months of age. He never raced. We were told his mom stepped on his back leg and it was broken and never vetted. When we adopted him, he had this horribly crooked leg with several large calcium deposits. We had his leg rebroken and a plate with 8 screws in it (over $3000). A year later it migrated (and he grew) and we had it removed. We’ve had as many as 5 rescued pups at one time but are down to one – can’t do more being retired. Jake is my baby. Here are pictures of Jake (a red brindle) eating one of the thin almost-the-same-color-as-him bully stick. Thank you for safe products. Jake (a red brindle) with Junior Bullys..
We are very happy to hear how much Jake enjoyed our treats. It makes us happy knowing that we are offering healthier treats and chews to make the furriends smile big. What treats does your furriennd love most from our K9 restaurant “Yassy’s Gourmet Dog Kitchen“? 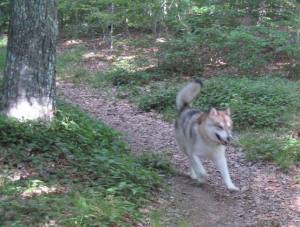 Today,I would like to introduce the Malamute furriends “Lakoda”. Recently, we have received feedback from Lakoda’s mom Brenda from ME, along with a beautiful picture of Lakoda. We live in rural Maine and are surrounded by literally thousands of acres of woodlands. 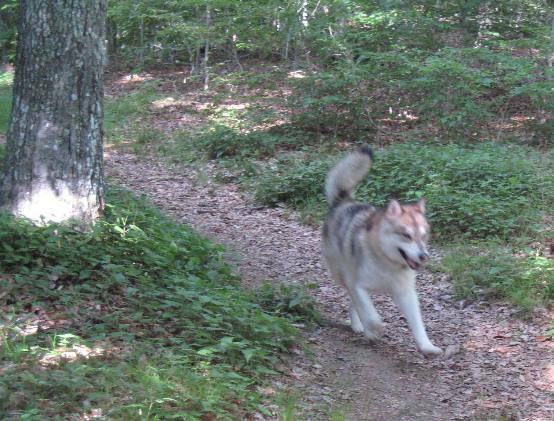 My malamute, Lakoda Raven, and I walk these woods every day, except during the winter when he either runs the trails with me while I cross country ski or pulls me in a kick sled. Lakoda playing with the water.. He is energetic, adventurous, and always hoping that he will be able to cajole me into following him into new territory and that I will oblige him. Sometimes he gets his way but usually I pick him up at a rendezvous spot some distance from the house. If I don’t do that he will race back to the house, and while I’m happy that he’s anxious to return home, I worry about his crossing the road in front of the house and continuing up another road where he visits with two other dogs at neighboring properties. I originally used a piece of the lamb weasand twists to call him back to me for pick up until he decided that it was more fun to try to beat me back to the house. Then I switched to the Down Under Roo Jerky and surf/turf jerky and that has made all the difference. Now he turns to watch me as we approach the rendezvous spot and he waits there, smiling and with tail wagging, for me to catch up and give him the jerky. Sometimes he dances while I take it from my fanny pack. As soon as he finishes the piece he turns for home and connected to our life line, the leash, we start back together, but not without my giving him a big bear hug and receiving a face licking in return. Thanks, Yassy, for producing these treats for us. We are both grateful for them. I am happiest when my little beast is happy, and I love to see the fire in his eyes when he knows he is about to receive something wonderful! We are very happy to hear how much Lakoda’s enjoys our treats. It makes us happy knowing that we are offering healthier treats and chews to make the furriends smile big. is almost near Thanksgiving day, and soon after, we will have Christmas coming around the corner. for moms and dads to place under the beautiful Christmas tree for them. We, Yassy’s Gourmet Dog Kitchen, have been busy re-stocking all the treats and chews for everyone to shop for their precious paws. greeting “Woof,Woof” to let me know they are here with the boxes. The other day, we were out for walking and, Palette suddenly stopped,looking at one direction with her ears straight up,and she looked very anxious to welcome whatever she felt from that direction. I stood at one spot,looked around but I did not see anything but then soon after,I noticed what made her super alert mode. It was FedEx guy’s van. He knows us and,he stopped the car, rolled down the window and said that he got something to deliver and, he drove off. Whole time we were talking, Palette’s nub was going left,right,left right with her ears fold with woof. She knows that the FedEx guy sometimes bring boring boxes,which she is not interested in finding out what he brought but he brings lots of boxes that smell yummy and she tend to get excited for FedEx guy’s van. Have you picked special present for special furriends already? their names on, and would be counting down the days to the Christmas. Today,I would like to introduce the Corgi furriend “Darby”. with very cute taste testing videos for dehydrated Duck feet,and we wanted to share the videos with you. now and then, I give her dehydrated poultry feet such as dehydrated duck/chicken feet treats as well. source rather than synthetic forms. You can find gullet treats,trachea treats at Yassy’s Gourmet Dog Kitchen also. Available in beef,buffalo,venison,and lamb. Darby’s mom “Cindy” told us that it was his very first experience with Dehydrated Duck feet. Lets find out how he thinks about his very first dehydrated duck feet treats. If you are a blog subscriber,please click here to watch the video Part 1, please click here to watch the video Part 2. We love to make furriends smile with healthy chews! Please let us know how your furriends enjoyed their treats from us. Now and then, we pick the customers’ taste testing pictures,videos to be featured on our blog. This year, if you were featured on our blog, we are giving away $10 off VIP Thank you coupon code as a token to thank you. I hope everyone will have a great Thanksgiving day! It is December, and many dogs will be so exciting to see UPS/USPS/FedEX guys frequently walking toward their house carrying box-ful of goodies for moms and dads to place under the beautiful Christmas tree for them. Our k9 Executive chef “Palette” sees UPS/USPS/FedEX guys walking toward our house with high pile boxes from top of the stairs,and she gets so excited. Her little nub going right to left,right to left with big loud greeting “Woof,Woof” to let me know they are here for the boxes. I am sure they are very anxious to find out what are in the boxes with their names on, and would be counting down the days to the Christmas. Today,I would like to introduce the Poodle Mix furriend “Diamond”. received feedback from Poodle Mix furriends Diamond’s mom “Jan” from WV with very happy story,and we wanted to share the story with you. My little dog “Diamond” has skin issues, and already these buffalo trachea seem to be helping. Plus, he loves them! Maybe my next order I might try the lamb trachea, since this time I ordered a couple of lamb ears, to give us a chance to see if he is allergic to lamb. So far we seem to be good with venison and buffalo! Duck, alas, was too close to chicken, I guess, and made him itch like crazy… so my other little dog, a boston terrier, will probably get to enjoy the rest of the duck feet I bought before. Allergies are awfully tricky, but it is such a joy to see him getting better, bit by bit. I adopted Diamond back in July from our local no-kill shelter, and he was in pretty bad shape. Now he is bouncy and happy, and our goal is to try to grow back some of that hair he has lost over so many years before. I think the buffalo trachea help his skin and fur – his skin is so much stronger than it was when he first came (it would bleed at the least touch, back then), and his fur actually has a bit of a shine to it. Of all the hair I want to grow back in, the part I want the most, probably, is the top of his poor little long nose. It is quite bare, but at least now it looks shiny and almost healthy; when he came, it was covered in scabs, from his constant scratching at it, and his whole face and mouth (also covered in scabs) was so sore he couldn’t bear to have anything touch it. 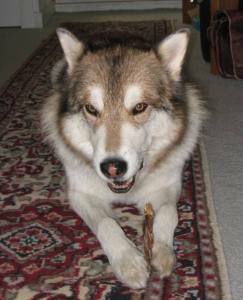 So, to see him sit down and chew through a piece of buffalo trachea for 20 minutes is a great joy to me – just that he is well enough and feels good enough to do it. Thank you also for all the other goodies. The deer antler with velvet is a big hit with both dogs. 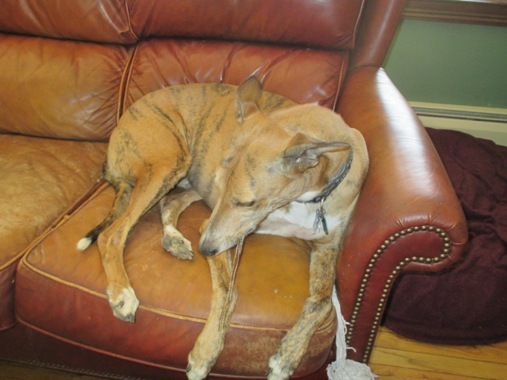 part of his recovery and, we hope Diamond will continue to improve his skin condition. As you can see, his mom “Jan” is trying “wheat-free” due to his skin issue, and when she places an order on SnackSaturdays;the days your orders will come with one count of free Yassy’s Gourmet Dog Kitchen brand biscuits/Jerky (More detail on Snack Saturday program here. ),she lets me know that it is Diamond’s and ,therefore,she would like no biscuits with the order by using special instruction box provided when ordering. Since we know Diamond’s issue, we substitute the Baguette biscuits with the Buffalo Trachea,which I heard that he is such a big fan of, when Jan order on Saturdays. If your dogs had allergy or skin issue like Diamond’s,please use the special instruction box to leave a message for us. We will try our best to find the substitute for the Snack Saturday treats. Today,I would like to introduce the Rough Coat Collie “Haddie”. 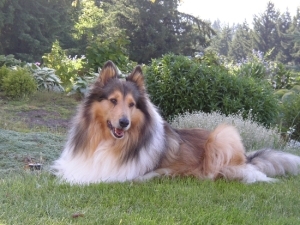 Recently, we have received feedback from Rough Coat Collie furriends Haddie’s mom “Peggy” from OR, along with a beautiful picture of Haddie. We have a beautiful rough coat collie who absolutely loves your items! We really appreciate the way you package everything, thank you so much! vaccines and she became the victim of vaccinosis. Since that time we have battled to bring back her health, as she almost died as a result of this assault. She is doing much better now, as we have her on grass fed raw beef as her primary food source, as well as many nutritional supplements, with now include your products. And yes, she loves the baguette biscuits! Hearing about Haddie’s event resulted with vaccinoisis, we are honored to be part of her recovery and, we hope Haddie will get better soon. In the previous entry titled ” Titer test for dogs“, I wrote about titer test,over vaccination, Rabie Challenge found,which is the project that Dr Schultz, who is a professor and chair of pathobiological sciences at school of veterinary medicine, and his team would try to get the evidence to show that the Rabies vaccine can last longer than 3 years, possibly 5 years, 7 years, and avoid unnecessary re-vaccination to cause adverse reaction from the vaccine. I also wrote about my experience with the the previous vet who asked about re-vaccination for Bordetella, and something else on Palette’s annual checkup day. Since I believe that vaccination is not going to be given without risk, and I do not see the point giving those vaccinations to Palette for the disease , for example, Bordetella, she would be less likely exposed to (She does not go to dog parks, she does not go doggy day care or any other places where many dogs are ). So, I said “No,thank you” for the re-vaccination such as Bordetella. Looking back now, before I know better, Palette was given great amount of shots by a previous vet. He gave her following shot:Bordetella,Corona virus,DHLPP LA,Giardia,and Lyme disease,Distemper Parvo HA,Leptospirosis 4 ways,plus Rabies. Looking through the shot records, Palette has received a couple of vaccines on the same day. Some of the shots were 4 ways,some of the shots given against was disease commonly found only on young puppies or in particular situation like boarding etc..and, expiration date noted on the medical sheet for the vaccination types had yearly expiration on every single one of them. If we stayed with previous vet,Palette would have had all of these lengthy list of shots every year even though she is now 6 years old. I think it should not have been like that and, we should consider risk vs benefit and choose the minimal vaccine for our furriends to live healthy,happy,long life. Some of you may not know what “Vaccinosis”is,and what “live vaccines” is,so I will explain those below. Vaccinosis is the term to describe adverse reaction from vaccines/over-vaccination. For vaccines,there are two types of vaccines. One of which is “killed vaccine”, and they are the vaccines that contains inactive virus/bacteria with adjuvants. The other is called “Modified live vaccine”, and it contains weakened live virus/bacteria and, they are injected into the dogs and, in a theory, the virus/bacteria gets reproduced in dogs’ body and stimulate dog’s immune system by mimicking the disease the vaccines were given against. In the past, when Palette was a puppy and younger, I assumed that everything what vet says is what we should do for the health for Palette, but then, after switching her diet to the raw diet and started paying more attention to overall health matter, I learned a lot more. Learning about over-vaccination was one of them, and I hope more and more people would pay attention to what they are giving via vaccination and, I hope many more people would stop and think for a moment whether the vaccination in the question are necessary or not. It is a conclusion of me weighing risk vs benefit.I prefer not over-vaccinate Palette. great pictures of Ava and her crew. We received the free Down Under Roo Jerky. * Thank you! I now understand why the note said to store in the freezer. I had it on the kitchen counter, went downstairs and when I came back up, it had disappeared, and the plastic bag was on the dog bed. Something that must be that good needs to be secured…. They love everything we get from you! 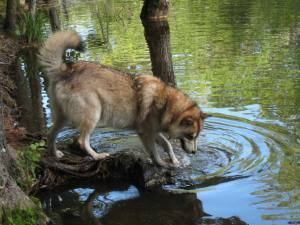 However, she is such a smart dog that if you let her, work at it and complete the food retrieve mission. One time, when we left the table for a short moment leaving one Olive Garden bread stick on paper napkin, she grabbed the paper napkin and pulled to her and let the bread dropped it on the floor and ate the whole bread stick!! We are glad to hear that Ava and her crew are big fan of Down Under Roo Jerky. If you order on Saturdays, you can get free GDK treats. For more information on Snack Saturday offer,please click here. Recently, we have received feedback from Corgi furriends’ mom “Marian” from TX, along with great picture of Molly (red and white) and Bonnie (black headed tri) being busy gnawing their Antlers. samples! I took a picture of them enjoying their chews. Molly (red and white) and Bonnie (black headed tri) being busy gnawing their Antlers..
their new chews, and I know they will love their lamb trachea and beef tripe treats, too! Palette, our k9 executive chef, sometimes gnaw Antler with superman style; 2 legs kicked out. Recently,we got feedback from Corgi furriend named “Gimli” from Corgi Country. What do furriends at Corgi Country think about our treats? Read on.. Note from Yassy’s Gourmet Kitchen; We put one count of Free Free Range Lamb Trachea with every order. Gimli’s mom also got Buffalo liver biscuits (Baguette biscuits) through Snack Saturday program since she placed an order on Saturday. You can read more on Snack Saturday program here. off! This is really great because Grammy also got us some “Surf Turf Jerky” that Yassy makes from wild caught salmon and Buffalo meat. Just recently, we have received happy message from terrier furriends’ mom in Hawaii,and I wanted to share it with you. and agility classes, my dogs are all lying on their beds chewing their antlers. Thank you for getting it here so quickly. We got feed back from their Corgi named “OC”.What OC and others think about our treats? Read on.. If you are a blog subscriber or reading from facebook, please click here to watch the video. To watch rest of feedback videos ( they got 2 more videos ), you can click on Part 5, Part 6. Also, OC has told us they have “Miss Mercy’s Mystery Monday” for a chance to win Dott’s Book or Gift card or Miss Mercy’s Mystery Budge. It looks fun! You can see me (Palette) appeared in the mystery question here.